I love stories (I know, who doesn't). Listening to them, telling them, reading them and writing them. I spent my entire childhood reading. At school, I would hide books inside my desk and read them during class in secret. I was scolded on more than one occasion for not paying attention in class. At night, after I was put to bed, I would ask my mom to leave the hallway light on. Then I would sneak to the doorway and read my book in the dim light of the hall. When that tactic did not work, I would sneak to the bathroom to continue reading. I struck gold when one of the books I bought from the bookstore came with a reading light. With this gem I could read the night away in the comfort of my own bed. I also loved to write stories, poems and character sketches. To this day I have, stored safely away, notebooks and binders filled with my young mind's musings. My first masterpiece was written at the tender age of ten. Writing a story was part of a school assignment which was based on the theme: a picture is worth a thousand words. I still remember the picture; it was of the side of a brick building, painted white. Against the building, leaned a bike, near a mail box. My story was of a young girl, who would bike to the post office every day to pick up the mail for her family (I never said I was original). One day, she picked up the mail and discovered a letter that was addressed to her father, referring to him as an officer. She uncovered in the letter that her dad's life was being threatened by a criminal that he had put away in the past. The girl had always been told that her dad was an accountant, and so the story is of her adventure to discover the truth about her father and his secret life. I still have a hard copy of that story, printed on old computer paper. The kind that had to be torn apart into individual pages and had the edges with the holes in them that could be ripped off. It is practically an antique. I had also loved to tell stories when I was in grade school; I had quite the imagination. The problem with my tales is that I pretended them to be true, even though they were made up. I remember long bus rides home at the end of the school day, exchanging stories with a friend who am sure was also making things up. We would compete with our stories of who had the craziest life. It was like whoever had the more interesting story would win some imaginary prize. I was in grade 8 when I realized that there was something wrong with my propensity for telling tales. I remember very clearly being in the midst of one story; I was at home on the phone, sitting at the top of the basement stairs. I was recounting to my girl friend my imaginary day at the fair, with a friend, who I claimed was very sick and was in a wheelchair. After I had told the story I felt so guilty that I immediately confessed my lie, greatly catching my friend off guard. I was so ashamed that I honestly never made up a story again. To this day, I find it impossible to lie and have been known to blurt out the truth even when it has the potential to get me in trouble (for another post). Today, I made this soup, originally wanting to use up a bottle of milk in my fridge. Instead, nearing the end of making the soup I realized it was perfect (and vegan) without milk. 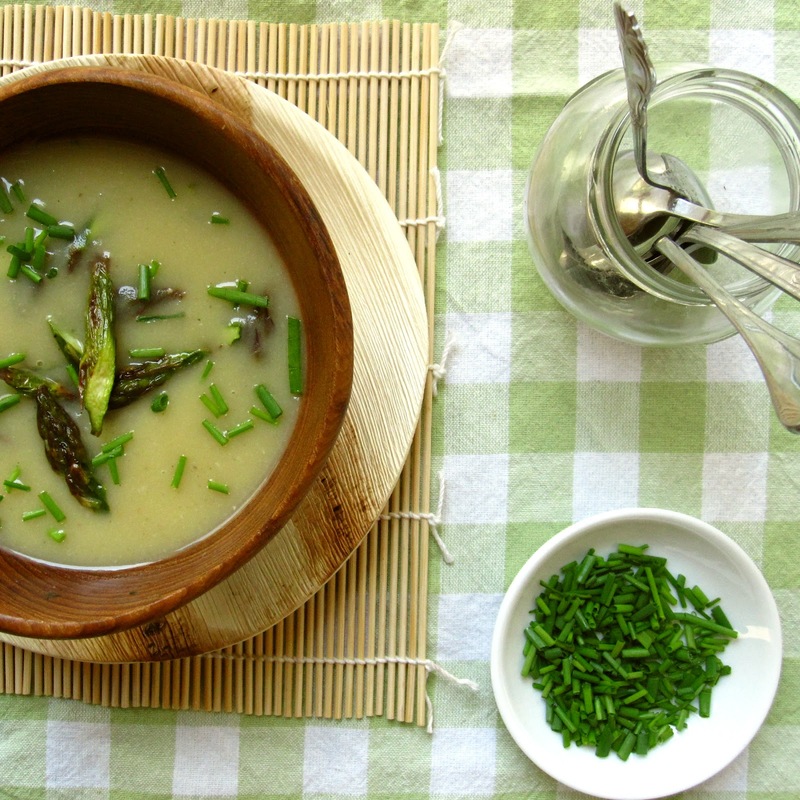 My favorite way to prepare asparagus is to roast it, so this is how I prepared it for my soup. 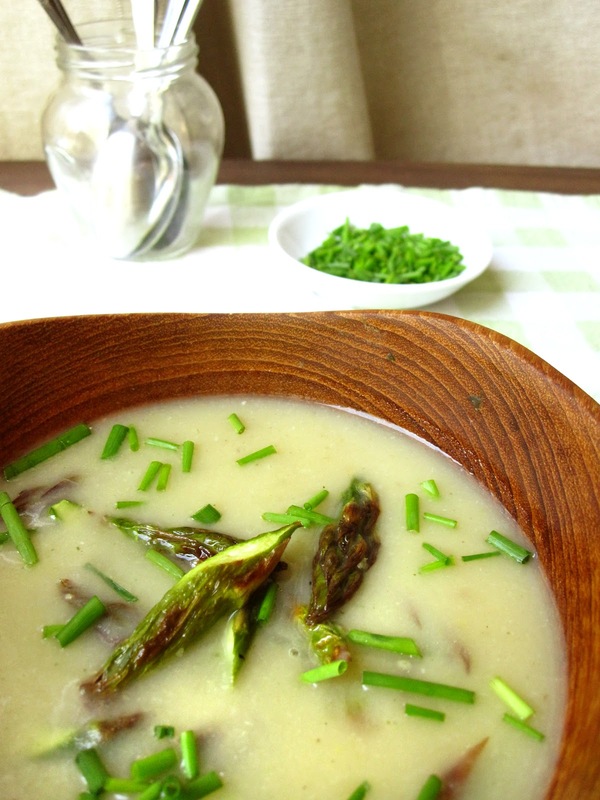 While the asparagus was roasting, I cooked leeks, shallots and potatoes in a pot with some vegetable stock. I pureed everything before stirring in the asparagus. 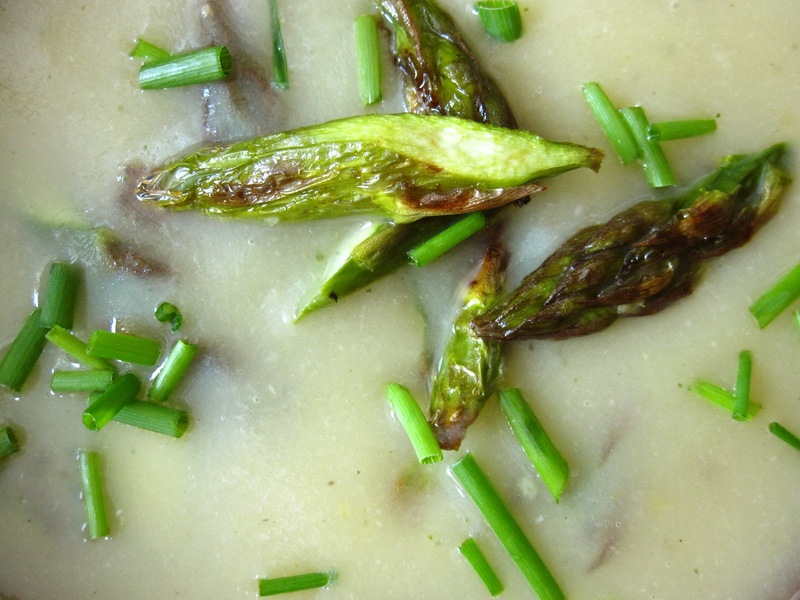 If you prefer, you could try pureeing the soup with half of the asparagus and adding the rest of the whole asparagus after. In this soup I opted to purée all of the ingredients except the asparagus, which I added to the soup after puréeing. With the leftovers I tested out puréeing half of the soup with the roasted asparagus in it and then mixing it all together at the end; this tasted great and added a little bit of a green colour to the soup. 2. Toss chopped asparagus in olive oil, sea salt and 1 crushed garlic clove. 3. Spread asparagus on a baking sheet covered with parchment paper and roast for 20 minutes, turning once. 4. In a soup pot, heat a tablespoon of olive oil over medium-low heat, stir in chopped leek, 1 clove of crushed garlic and shallots. 5. Cook, stirring frequently, for 8 minutes. 6. Add stock to pot and chopped potatoes. Bring to a simmer, cover and cook 10 minutes. 7. 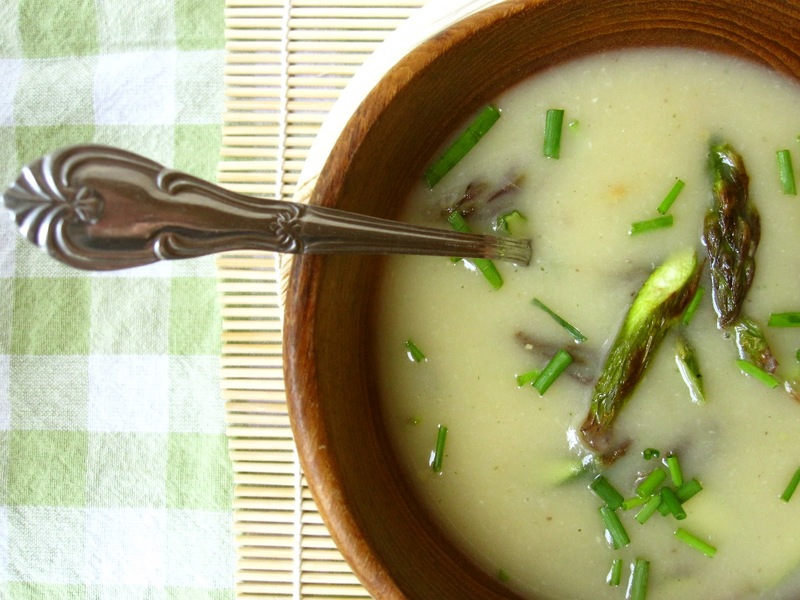 Allow soup to cool, then puree until smooth in a blender. 8. 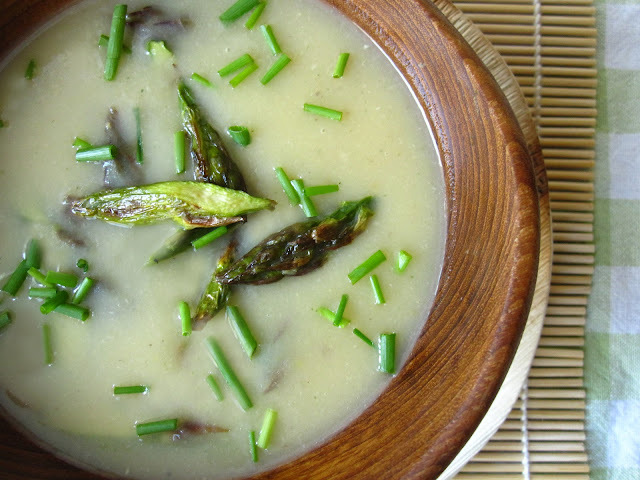 Add soup back to pot, stir in roasted asparagus and reheat. *Alternatively, purée half of the roasted asparagus into the soup and add the remaining, intact asparagus before warming and serving. 9. Serve soup garnished with chopped chives or green onion. Looks like it would go well with a piece of crusty loaf of bread.